Revered nonfiction writer Joseph Mitchell worked for The New Yorker from 1938 to 1996 but never published a word after 1965. The first new work of his to appear in forty-eight years did exactly that: appeared. With little fanfare or announcement of its arrival, not even a perfunctory tweet, the piece was slipped inside The New Yorker’s February 11, 2013 issue with all the ceremony of a subscription card. Entitled “Street Life,” the piece is one of three excerpts from a memoir that he started in the late 1960s and early ’70s and never finished. After filing his classic profile “Joe Gould’s Secret” in 1964, Mitchell never submitted anything else for publication. For the next thirty-two years, the magazine kept him in their employ. He regularly came to his office, dressed in suit and tie. His colleagues heard typewriter keys tapping behind his closed door. They passed him in the hallway and rode the elevator with him. This is how it went until he died in 1996 at age eighty-seven. No one knew what he was working on, and no one seems to have asked. As fellow staff writer Roger Angell later wrote: “No one made jokes about him, or expressed ill temper about him; there was pride, in fact, about working for a place that would indulge such an epochal oddity. The piece, when it came, would be worth the wait.” The piece people expected never arrived. Unless Mitchell biographer Thomas Kunkel finds unpublished profiles in the author’s papers, these three first-person narratives might be the only new work readers get. The question is whether they were worth the wait. This new excerpt comes to us from Thomas Kunkel, author of Genius in Disguise, the biography of New Yorker founding editor Harold Ross. Kunkel discovered it and the others while researching a forthcoming Mitchell biography. The New Yorker plans to publish the other excerpts at some point in the future. I’ve written about Mitchell before, specifically about his enormous direct quotations and what they reveal about the nature of truth versus fact in narrative nonfiction. Like many Joseph Mitchell devotees, I’d been waiting years to read something new from him—ten, to be exact. Other fans, some who have been reading Mitchell since the ’60s, had been waiting forty years. And then there it was, a gem hewed from Mitchell’s estate, nestled between pieces from Susan Orlean, Adam Gopnik and Ian Frazier, regular contributors whose company might have made Mitchell’s presence and this February issue seem like any other, were his work and legend not partially defined by his preoccupations with death, the past and gallows humor. In this darker light, his story carries the eerie sheen of a message from the grave. I discovered the piece accidentally early Sunday morning. My girlfriend and I were lying in bed, flipping through the magazine, when I saw the words “By Joseph Mitchell” and sat straight up. “Mitchell?” I said. I stared in disbelief at the author’s photo on the title page: the unmistakable figure in a dark suit, hands sunk in his pockets, one foot folded over the other, standing confidently in front of Sloppy Louie’s, a seafood restaurant whose owner Mitchell profiled in his well-known piece “Up in the Old Hotel” in 1952. This memoir, and his visage, came out of nowhere. The suddenness of it, like his sly expression and distant stare, gave me chills. Here was a man reporting on his own life seventeen years after it ended, in words he put down four decades ago. I read “Street Life” twice that day. As someone who has read about Mitchell extensively, I’m tempted to say that I knew this work was there, hidden in his papers among the discarded profiles and pieces that went nowhere. Signs of continued production pepper the historic record. Besides the recollections of colleagues hearing Mitchell’s typewriter keys, Mitchell’s daughter Nora Mitchell Sanborn told The Guardian in 2012: “[My] father was always writing. He would talk about certain projects and get involved in a million things. He had oceans of paper in many file cabinets, at home and at the office. Unfortunately these papers have been in storage since he died and in the charge of his executor [from whom his daughters are estranged].” The truth is that I never would have guessed those oceans of paper contained a memoir. In The New York Times recently, New Yorker editor David Remnick said, “What’s so poignant about [the excerpts] is the sadness of the incompletion but the brilliance of the voice.” The voice, the declarative sentences, the catalogues of details, many of the hallmarks of Mitchell’s canonical nonfiction are here. What’s different is the volume: that recognizable voice often takes a maximalist tone, what Remnick describes as “more Joycean.” Mitchell is still pushing the boundaries of the form, seeing how much material he can include before the paragraphs bend and narrative snaps. But the lengthy sentences, long lists and repetition that defined pieces like “Old Mister Flood” and “Mr. Hunter’s Grave” now exhibit a manic quality. Where older pieces contained direct quotation that ran between four and ten straight pages, here we have a sentence on the first page that contains four hundred and thirty-nine words, thirty-one commas, one emdash, one parenthetical remark and a semicolon. Many paragraphs in “Street Life” reach such a dizzying pitch that you question the author’s mental state, even wonder if some sort of psychological collapse caused his forty-year silence. For some readers, the voice will try their patience and cause them to turn to the next piece. For others, the voice will deliver exactly what we’ve been missing. Later he says: “Pretty soon my obsessive curiosity began to dominate me, and I went to a succession of Masses in St. Patrick’s that encompassed seven Sundays, the Easter-cycle Masses, and then I went to Masses in such representative Eastern Catholic churches that are in union with Rome, Syrian-rite churches and Byzantine-rite churches and Armenian-rite churches; and then I went to Masses or Liturgies in some Orthodox churches, Greek Orthodox churches and Russian Orthodox churches and Carpatho-Russian Orthodox churches and Ukrainian Orthodox churches and Bulgarian Orthodox churches and Serbian Orthodox churches and Romanian Orthodox churches; and then I went to Liturgies in two so-called Old Catholic churches, one that I found in a Polish neighborhood in Manhattan and another that I found in a Polish neighborhood in Brooklyn.” It isn’t simply the information that’s important here, it’s the pleasure the author and the reader experience while hearing these items strung together, side-by-side. To my ear, it seems Mitchell has fallen in love with the sound of it all, the way each name offers a variation on the theme of churches and tunnels, Orthodox this and Orthodox that, adding a slight twist to the stock he’s temporarily toying with. In this way, Mitchell resembles a baby making sounds after discovering the sonic capabilities of its lips. The fact that the person who wrote this was well into middle age makes you think that, despite the dearth of published work, Mitchell still found great pleasure in working with words. If this piece provides many readers with their first taste of Mitchell, the exuberance and details might not provide a good introduction. It piece might run some of them off. In addition to the strength of Mitchell’s voice, the other difference between “Street Life” and his previous work is the subject matter. In place of characters like Joe Gould, shad fisherman and Caughnawaga Indian construction workers, the piece’s central character is Mitchell himself. Irrespective of its origins, this is the rarest sort of Mitchell piece: an entirely first-person narrative. If the themes are the same, “Street Life” offers unique particulars. We learn about a few specific moments from his explorations – his encounter with a priest in St. Patrick’s Cathedral, for instance, who told him “a church is simply four walls and a floor and a roof inside of which the Mass is celebrated. Never mind the ins and outs of the architecture,” and the way a certain Mass gave Mitchell “an aperture through which I could look into my unconscious, a tiny crack in a wall that all my adult life I had been striving to see through or over or around—” For all its detail and personal revelation, though, “Street Life” never answers the question at the core of his legacy: What else was Mitchell working on all those years? For seven pages, Mitchell speaks in a controlled frenzy, cataloguing his travels and the city’s topography, and when your patience starts to wane and you begin to wonder where the author is going with all this, he ends a sixty-seven line paragraph to say, “And now I must get to the point.” He then goes on for thirty-one more lines – not lists but a candid description of his paralyzing homesickness, where he felt at home neither in New York nor his native North Carolina – before drawing to what feels like a close: “Then, one Saturday afternoon, while I was walking around in the ruins of Washington Market, something happened to me that led me, step by step, out of my depression.” Ah, you think, here it comes, the moment of revelation, the insight we seek, a portrait of what he was doing for forty years behind his closed office door. Instead, he says, “A change took place in me. And this is what I want to tell you about,” and a black diamond icon marks the piece’s end. Because Mitchell never finished the memoir, we assume he never got around to writing the section that would have addressed this. “Street Life” provides a deeper look inside the mind of one of our best nonfiction writers, but its charms cause certain frustrations. To fans, Mitchell’s life was already incomplete. The memoir reminds us of this. After making peace with the permanence of the Mitchell mystery and the finality of his work, this story comes along out of nowhere and stirs up the kind of sediments that Mitchell’s characters dredged for fish and oysters, leaving readers with a renewed and possibly irrational feeling of hope, a sense that we might finally find out what he was working on all those years, if not here in “Street Life,” then maybe in the next memoir excerpt. If not there, then maybe in the next, or at least in Kunkel’s biography. The most seductive thought of all: That an entirely new long-form profile of a personality as compelling as Joe Gould might sit in the author’s papers, waiting to be discovered. Until Kunkel tells us otherwise, we are left with this titillating fragment, this story that repeats so much of what we already know in different language, and reminds us what Mitchell already knew: that we really don’t know as much as we think, that nothing is finished until we ourselves are finished, and that the known body of an author’s work exists, like the old wharfs and train tracks that lined the shores of New York Harbor, in a state of flux. It’s as if Mitchell came back from the grave to tease us. “Okay,” he seems to be saying. “You want to know what I was up to all those years? Sit down. I’ll tell you.” And just as he starts to speak, he disappears again. As much as I read, I don’t find myself rereading too many books. I’m no Larry McMurtry, revisiting the same book year after year. Mostly, I reread essays, and the pieces that I find myself returning to with most frequency were written by Luc Sante, Calvin Trillin and Joseph Mitchell. 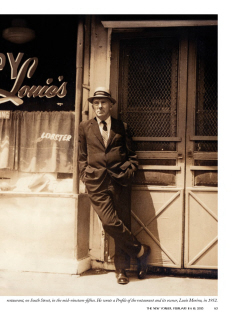 In his documentary stories for the New Yorker, pioneering nonfiction writer Joseph Mitchell celebrated both eccentrics and the average Joe, and in turn, he immortalized a scruffier, working class era of New York City. He also wrote what might be the longest quotes in our genre. When first published in 1956, Mitchell’s classic “Mr. Hunter’s Grave” contained 12,056 words; over nine thousand of them were directly attributed to Hunter as quotations. Many of the stories in Mitchell’s book The Bottom of the Harbor are like that. “Up in the Old Hotel” contains a quote that runs for over four pages. “Mr. Hunter’s Grave” has one that goes for eight pages. “The Rivermen” boasts the longest of all: ten and a half pages – or six pages followed by four more, if you count the three-lines of intervening dialogue as an interruption. I don’t. But it’s not simply the length that interests me; it’s what length requires of a writer’s memory. Take this quote from “Mr. Hunter’s Grave,” where Mr. Hunter tells Mitchell about picking a plant called pokeweed: “I went up there one morning this spring to pick some, but we had a late spring, if you remember, and the pokeweed hadn’t come up. The fiddleheads were up, and golden club, and spring beauty, and skunk cabbage, and bluets, but no pokeweed. So I was looking here and looking there, and not noticing where I was stepping, and I made a misstep, and the next thing I knew I was up to my knees in mud.” Mitchell didn’t use a tape recorder, and he rarely took notes, which raises certain questions: how did he remember these details? The precise order in which Hunter listed them? And, if many of his quotes aren’t verbatim, then how much of his nonfiction is to be believed? 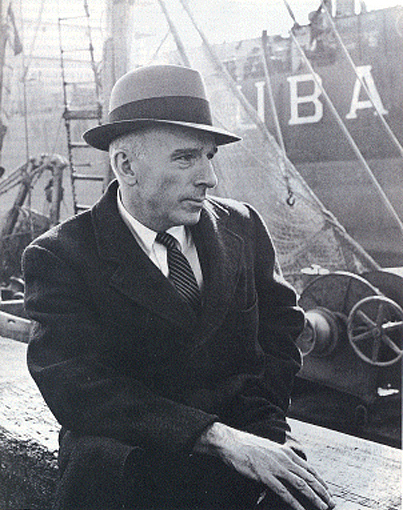 In his article for the Oxford American, “The Collector of the Everyday,” author Sam Stephenson doesn’t believe that Mitchell necessarily remembered details accurately every time – that Mr. Hunter said golden club before spring beauty before bluets – only that Mitchell got the larger truth right. William Zinsser, in his book On Writing Well, agrees with Stephenson and defends Mitchell’s technique and integrity: “Now, nobody thinks Mr. Hunter really said all that in one spurt. Mitchell did a heap of splicing. Yet I have no doubt that Mr. Hunter did say it at one moment or another—that all the words and turns of phrase are his.” Zinsser describes Mitchell’s stories as mosaics, literary composites that reflected Mitchell’s journalistic technique. He would befriend a knowledgeable and colorful source – a fishmonger, oysterman, tugboat captain, etcetera – and make multiple visits over the course of weeks or months, sometimes years, gradually gathering quotes, history, scenes and a sense of the cultural landscape. Then, Mitchell would assemble his stories over time, layering the material like some sort of phyllo dough pastry; yet he rendered these portraits to depict a particular occasion – a single visit to a graveyard, a single chat with a Bowery barfly – so that they are composites of facts, collages. He likely fashioned his Olympian quotations the same way. Certain critics might say that such composites are fictions, because the information portrayed didn’t exist in the real world in the precise way it was rendered. The composite only exists because the artist created it. I used to agree with this line of thinking. When I first discovered Mitchell at age twenty-five, I believed that George Hunter said those words in that way verbatim, because I assumed all dialogue in nonfiction was verbatim. Not a spliced rendition, not a near-accurate depiction, not a highly educated guess, but a replica, a photograph in text. I was naïve about the mechanics of nonfiction writing, and the complex nature of truth. Now, after a decade reading and writing narrative nonfiction, I still expect accuracy whether I’m reading a magazine or a memoir, but I also know that truth is more complicated than the usual “accurate/inaccurate” dichotomy suggests. If the parts that Mitchell used to fashioned his hybrid stories and hybrid quotes were facts themselves, then is not the collage of facts also true if it captures the larger truth of his subjects? By larger truth, I mean the essence of Mister Hunter’s personality, and the particular texture of his speech. And on a thematic level, I mean the emotional truth of Hunter’s situation: aging and looming specter of his, and everyone’s, impending death. This is part of what Zinsser means when he says that “all the phrases and turns of phrase are his.” He means that despite the splicing, Mitchell captured Hunter’s essence by accurately portraying his diction (like the way Hunter said “spring beauty” rather than “beauties”). Mitchell didn’t make quoted phrases up, didn’t invent information; rather, he simmered the facts so they accreted into a more potent truth, which is why the quotes sound like his speakers, rather than like Mitchell. This is also why I consider Mitchell’s stories nonfiction. Mitchell’s literary standard was that of both the artist and the reputable journalist. He organized his facts in a creative arrangement in order to best serve the story. As Zinsser says: “Although Mitchell altered the truth about elapsed time, he used a dramatist’s prerogative to compress and focus his story, thereby giving the reader a manageable framework. If he had told the story in real time, strung across all the days and months he did spend on Staten Island, he would have achieved the numbing truth of Andy Warhol’s eight-hour film of a man having an eight-hour sleep. By careful manipulation he raised the craft of nonfiction to art. But he never manipulated Mr. Hunter’s truth; there was no ‘inferring,’ no ‘fabricating.’ He has played fair.” By employing these techniques, Mitchell spared readers the superfluous details, framed the relevant information, and distilled the piece to its essence, for the sake of the audience’s reading experience. In this way, Mitchell’s stories predated the “nonfiction novel” of Truman Capote and Tom Wolfe, as well as the 1960s “new journalism” that followed after: using dialogue, character development, narrative arc, foreshortening, well-sequenced scenes, emergent themes, dramatic tension in nonfiction, rather than the who, what, where, when, why of standard expository reportage. Mitchell’s Olympian quotations are sure to remain one of nonfiction’s most peculiar attractions – an extraordinary monument to truth’s complex incarnations – but it’s his stories’ artfulness and readability that have made them endure.